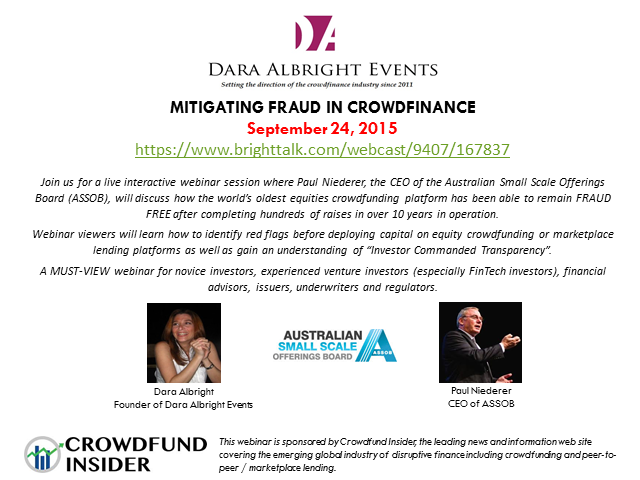 Join us for a live interactive webinar session where Paul Niederer, the CEO of the Australian Small Scale Offerings Board (ASSOB), will discuss how the world’s oldest equities crowdfunding platform has been able to remain FRAUD FREE after completing hundreds of raises in over 10 years in operation. Webinar viewers will learn how to identify red flags before deploying capital on equity crowdfunding or marketplace lending platforms as well as gain an understanding of “Investor Commanded Transparency”. A MUST-VIEW webinar for novice investors, experienced venture investors (especially FinTech investors), financial advisors, issuers, underwriters and regulators. This is the must-view webinar for any company interested in launching a token offering. Listeners will gain a firm understanding of the types of token offerings, the differences between ICOs and STOs, the regulatory landscape, the costs involved as well as insight into the ecosystem of token buyers and advisors. Presentation for Commonwealth Embassy's Billionaire Round Table Conference highlighting how modern financial technology ("FinTech") as well as a coinciding modern regulatory regime ("RegTech") can ensure the global democratization of capital. The FinTech revolution is upon us and with it comes a whole new marketplace of consumers, products and ideas. The new and exciting industry appeals to companies of all sizes and stages of growth from the smallest start-up to established giants. In this must-see program join Dara Albright and some of FInTech's and Finance's biggest names as they discuss how best to capitalize and be successful in this new market with your investment, business or consumer choices. You'll hear from Ron Suber of Prosper; Brian Korn, Manatt, Phelps and Phillips; Mark Rockefeller, StreetShares; Gene Massey of MediaShares; James A. Jones from IRA eXchange; and Todd Yancey of Investor Services all hosted and moderated by Dara Albright herself. - How innovations in self-directed IRAs will create new retail distribution channels for the entire alternative product universe. Depressed interest rates and volatile equity markets are driving an unprecedented interest in retail alternative investment products. Fortunately, through the intersection of technology and regulation, new FinTech archetypes are emerging to satisfy that demand. This webinar will highlight some of these groundbreaking technologies, tools, apps, rules and investment products that are transforming the financial services industry and changing the way people invest as well as save for retirement. This is a MUST-VIEW webinar for investors of all sizes, financial advisors, wealth managers, FinTech platforms, and regulators. This was a live presentation given to inspire 4th graders as they kicked off a unit about business. It was delivered at a Georgia-based elementary school on October 28, 2015. Join us for a live Q&A interactive webinar session with Rep. David Schweikert, the Congressman responsible for Title IV of the JOBS Act a.k.a Reg A+, and Industry Recognized Securities Attorney, Sam Guzik. The Congressman and Mr. Guzik will address not only everything you need to understand about the final rules, but also how Reg A+ will impact the small cap IPO market and how venture exchanges will fuel the Reg A+ market. Join us as Father of the JOBS Act, Dave Weild and Industry Recognized Securities Attorney, Sam Guzik discuss ways to enhance deal distribution and create liquidity for new small cap offerings such as Reg A+ crowdfinanced offerings (RACOs). Key discussion points will include status of Reg A+, using technology to enhance deal distribution, the legislative movement to increase tick sizes, building a solid base of aftermarket support and new venture exchanges for emerging companies. Join us for this timely and informative webinar as key sponsor of the JOBS Act, Congressman Patrick McHenry as well as industry influencers, David Feldman and Sam Guzik, illustrate how Reg A can play a critical role in facilitating capital formation. Can Reg A Crowdfinanced Offerings replace the conventional small cap IPO? Is a JOBS Act 2.0 in our imminent future? In the same way that crowdfinance has been transforming global credit and equity markets, it is now making its way to the real estate market and forever changing the way commercial properties are funded and built. Pioneers including Fundrise, Realty Mogul and RealtyShares are taking an asset class once reserved for the financially privileged and making it available to the general public. Join us for this informative webinar where the industry pioneers will discuss how they are revolutionizing the real estate market by providing the public with the ability to invest directly in properties and help foster local economic development. Since 2006, the P2P & online lending industry has been experiencing rapid proliferation. Lending Club and Prosper, America’s two largest P2P lenders have now surpassed $2B in loan origination. And the industry continues to garner immense attention from Wall Street veterans, technology giants as well as the financial media. This is a must-attend webinar for wealth managers, financial advisors and both institutional & retail investors looking for portfolio yield as well as investment bankers, individuals and business owners looking to raise debt financing in a hostile bank lending environment. Joy Schoffler, an experienced fundraiser and principal of Leverage PR, will share her in-depth experience in community building and public relations. Prior to launching any crowdfunding campaign, startups should have a solid network of supporters from their own social networks to contribute on day 1. Starting is the hard part – but with a solid plan, any entrepreneur with a solid business plan and a great idea can use crowdfunding to make it to the next level. Rose Spinelli, accomplished journalist and crowdfunding consultant, will discuss how to attract media attention to a crowdfunding campaign. Alon Goren, CEO and co-founder of fundraising platform InvestedIn, will give advice to entrepreneurs, non-profits and anyone interested in rewards-based crowdfunding on how to make the most of their fundraising campaigns. Donations- and Rewards-based crowdfunding has exploded over the past two years, with some companies raising millions of dollars in pre-sales for their startups and creating a supportive community in the process. Alon is a strong believer in the power of social enterprise and will give insights into the best marketing and community-building tactics for organizations to be successful fundraisers online. This is a must-attend webinar for any business looking to raise capital via any type of crowdfunding. As the SEC neglects mandated deadlines for implementing key components of the JOBS Act, America’s businesses constituting all sizes and industries are losing valuable opportunities to raise expansion capital, innovate and create new jobs. At the same time, America’s smaller investors continue to miss out on the chance to recapture portfolio yield and help fuel economic expansion. Fortunately, the States are beginning to adopt their own legislation that legalizes crowdfunding under an intrastate exemption. Join us for this insightful webinar and learn how intrastate crowdfunding is set to unite communities and inspire local economic growth. Moderator: Dara Albright, Founder, NowStreet – Panelists: *Douglas S. Ellenoff, Partner at Ellenoff, Grossman & Schole; * Richard J. Salute, CPA, Consultant with extensive expertise in capital markets and securities regulations; *Jeff Bekiares and Megan Johnson, Co-Founders of SparkMarket, the nation’s first bona fide crowdfunding portal allowing unaccredited investors to legally crowdfund via intrastate exemption. Since the signing of the JOBS Act in April 2012, there has been a lot of speculation as to how the angel and VC community will participate in crowdfunding and view businesses possessing heavily populated cap tables. Chris Camillo, an accomplished angel investor, author of Laughing at Wall Street and one of the country’s top crowdfunding industry analysts will show issuers how to obtain angel investors during and after crowdfunding campaigns. This webinar is ideal for any company seeking to raise capital via the forthcoming crowdfund exemption as well as any professional guiding new crowdfund issuers such as investment bankers, investor-relations professionals, brokers, emerging portals, CPAs and attorneys. The “Preparing Issuers for equity-based Crowdfunding” webinar is ideal for any company seeking to raise capital via the imminent crowdfund exemption as well as any professional guiding new crowdfund issuers such as investment bankers, investor-relations professionals, brokers, emerging portals, CPAs and attorneys. JOIN Us Tuesday April 2, 2013 at 1:00pm for tank instructions and to ensure that you are ready for your Crowdfunding check dive. Learn the latest Crowdfunding techniques, plus essentials to compete and keys to a winning campaign. Once you receive the tools, you will have an chance to win a featured spot at The Ritz Group's, "Crowdfunding Shark Attack", a nationally webcast event where you will be able to pitch your campaign to three crowdfunding industry experts. A wave of financial innovation and regulatory reform is revolutionizing Wall Street and popularizing new asset classes aimed at democratizing the flow of capital and giving smaller investors and businesses greater opportunities to prosper. As a result, the financial services industry is undergoing a dramatic transformation that is rapidly rendering traditional banking and brokerage revenue models obsolete, conventional capital raising strategies unfeasible and typical asset class returns negligible. NowStreet’s new webinar series, “Capitalizing on Financial Innovation” is designed to help broker-dealers, investment bankers, financial advisors, issuers and investors capitalize on this surge of industry disruption. Part I of this timely webinar series will focus on crowdfunding and is aimed at properly preparing investors, asset allocators and issuers for the forthcoming Crowdfunding Revolution. Webinar participants will be armed with the latest financial and legal knowledge from renowned crowdfund industry experts. They will also learn how to employ the social tools needed to succeed in this emerging industry. On November 15, 2012, the Securities and Exchange Commission held a long anticipated forum to tackle JOBS Act implementation. This important webinar will provide an overview of what transpired at the November 15th meeting and discuss how it will impact America’s financial markets. Webinar attendees will gain valuable insight into how the new rules are being employed as well as how these changes will affect broker/dealers, financial advisors and wealth advisors. Listeners will also attain a broad understanding for what is being done to foster issuer transparency and facilitate the due diligence process. The JOBS Act allows hedge funds to advertise directly to investors for the first time. Hedge fund executives and marketing managers have set their sights on attracting the high net worth clients that have, until now, been the exclusive providence of wealth managers and financial advisors. Financial advisors and wealth managers need to educate themselves and their clients about the JOBS Act and hedge funds as well as strategically communicate their value proposition to their clients or risk losing them to hedge funds. Digital finance is rapidly changing how we invest, raise funds, borrow, lend, pay for goods and services and save for retirement. It is reinventing currency, democratizing the flow of capital and giving rise to a new generation of tech-centric financial leaders. Dara Albright Media provides a wealth of free resources & information to help all members of the financial ecosystem capitalize on this incredible transformation.